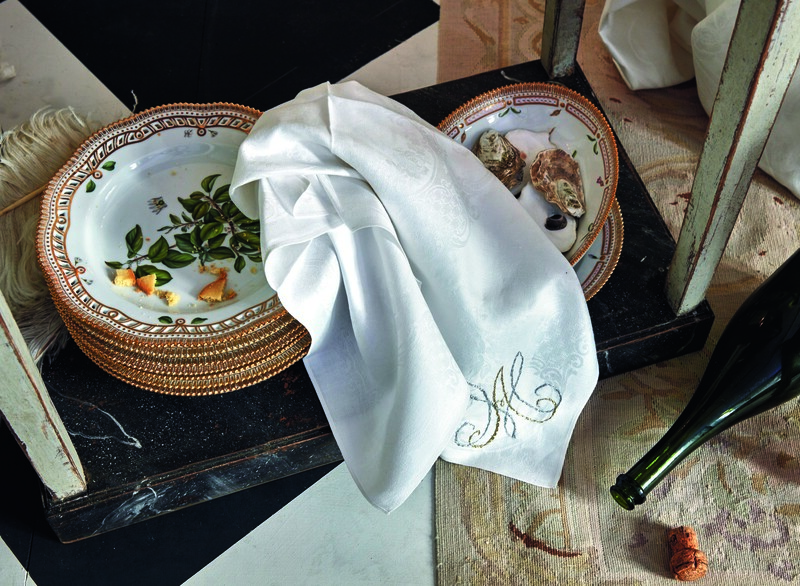 This year’s fashionable Christmas table tour features inspirations from European clothing designers. 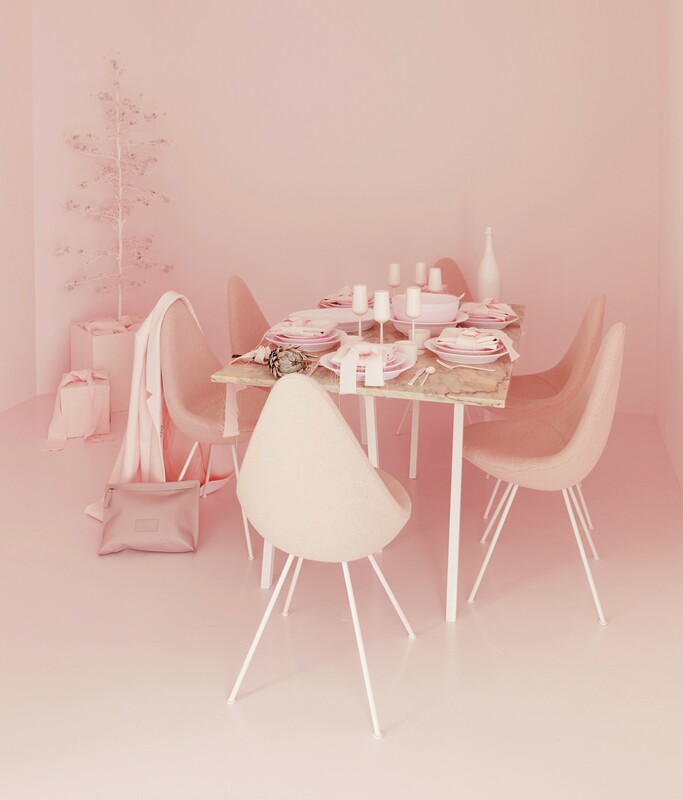 For a fashionable Christmas “Think Pink!” Designer Charlotte Eskildsen certainly had a rosy view of her minimalist Christmas table –a riff on that fashion anthem. 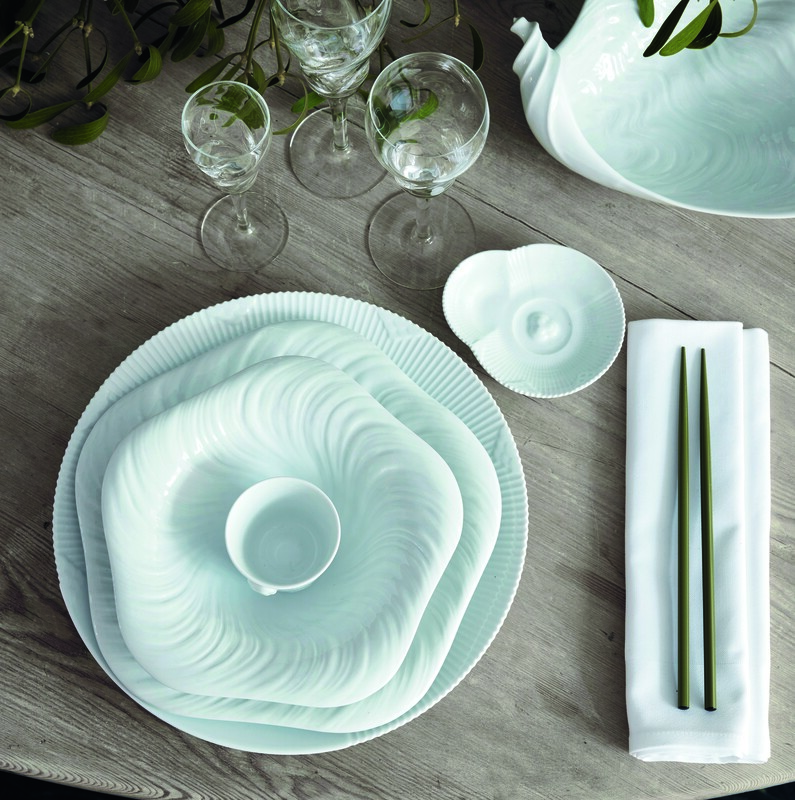 Even Royal Copenhagen’s streamlined White Fluted porcelain goes blush here. 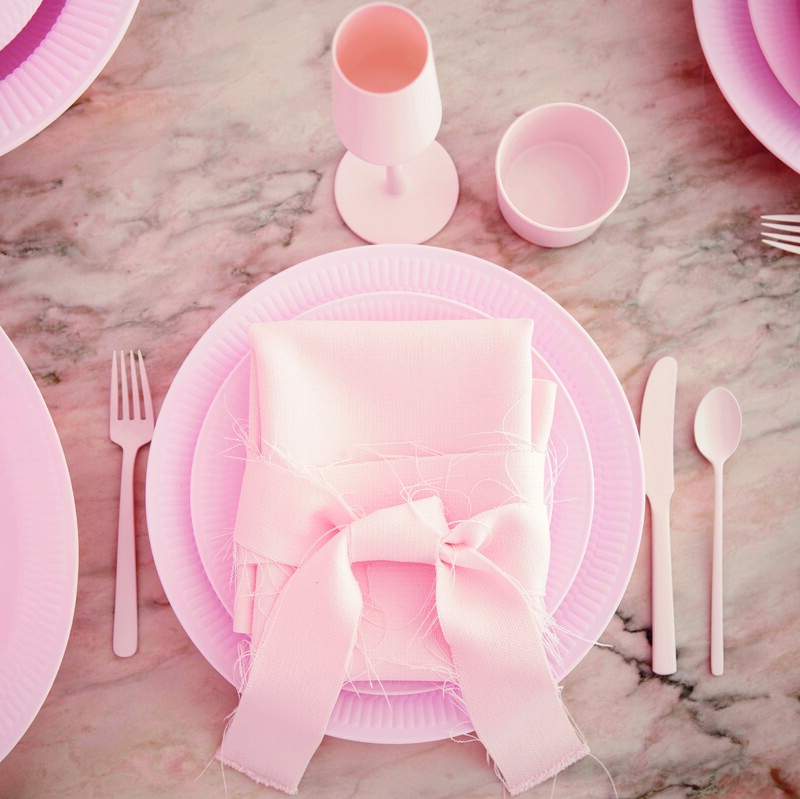 The monochrome table looks like Christmas dinner in pink fog. It has the dreamy quality of a fashion show fantasy. I love this one as it’s so unique. 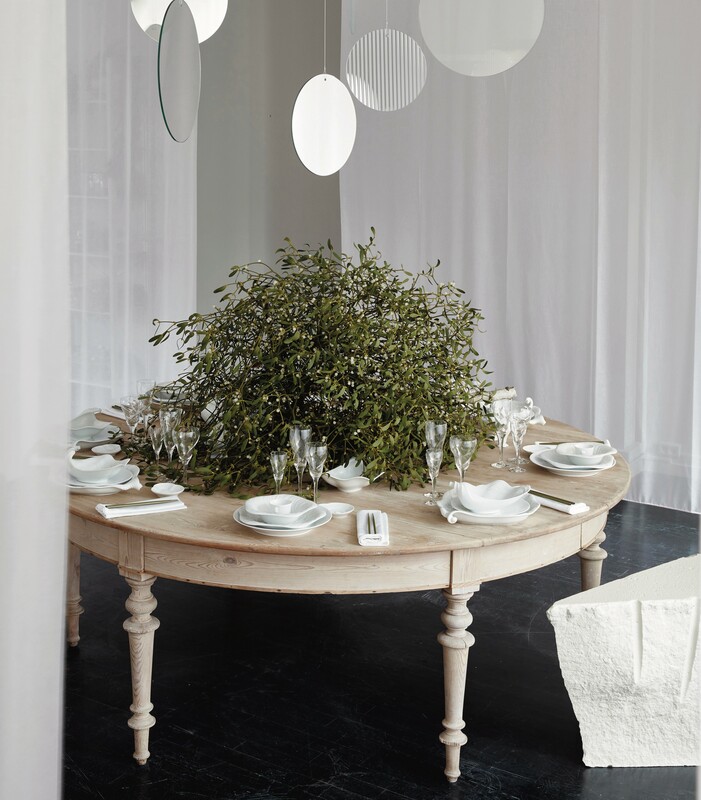 Quintessentially Scandinavian, the big round whitewashed table is dominated by a naturalistic green centerpiece. To me, it feels both organic and familial — precisely the point designer Mark Tan wanted to make for his vision of a fashionable Christmas. A central forest of spiky greenery dominates the table and yet feels so simple — as if someone just went outside and cut them. At first I thought the white globes were tiny electric lights. But they may well be white berries. 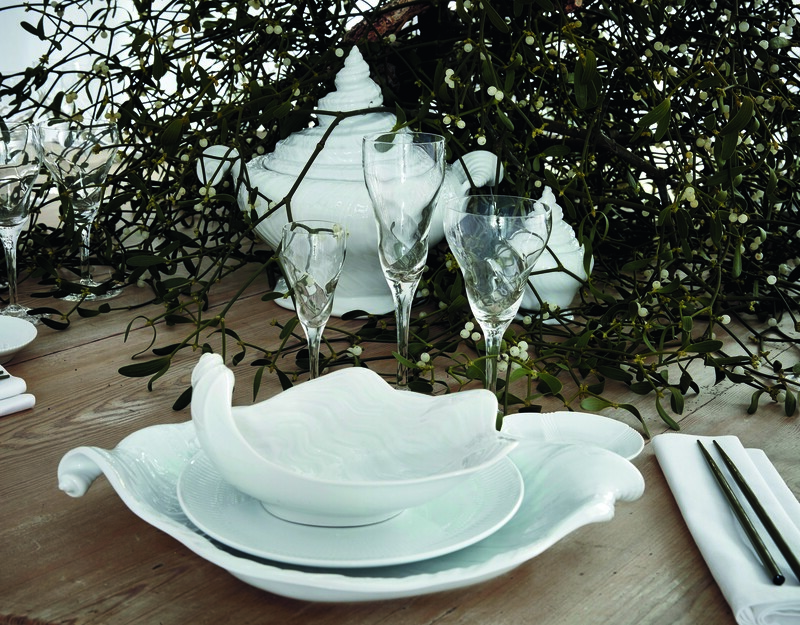 White on white is always a reliable Scandinavian décor theme — here on the juleborde it’s expressed with RC White Fluted dinner plates topped by Arje Griegst’s Conch series of shell shaped bowls. 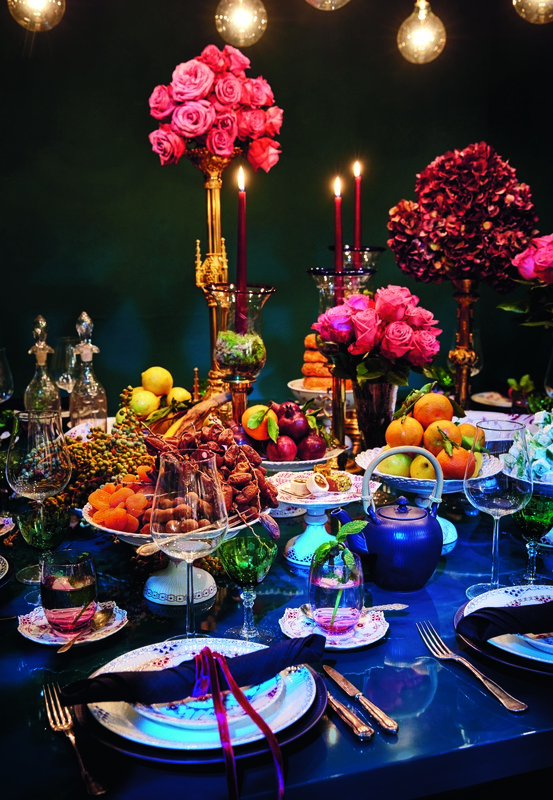 Exotic and lavish, the Christmas table by Iranian-born designer Leyla Piedayesh, of lala Berlin, feels slightly mysterious and celebratory. 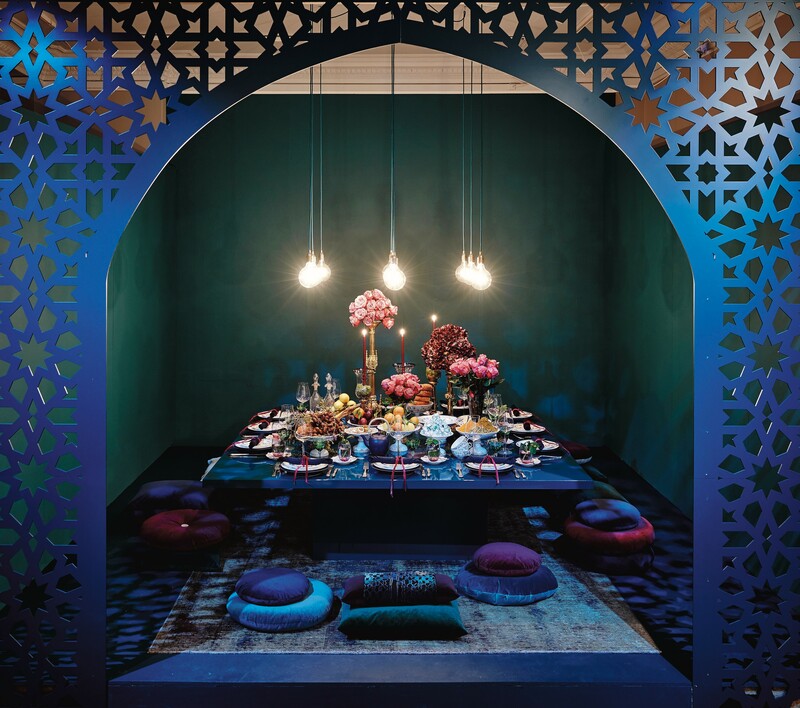 The pierced screen and Moorish arch help create an intimate space for the low table and its cushions on the floor. The dark midnight blue table and walls sets off the Blue Fluted and Full- and Half Lace Purpur dishware patterns while bright colors of the tall flowers, red tapers and mounds of fruit and sweets give this table a generous spirit. I can almost hear “We Three Kings of Orient Are,” playing in the background. It’s an unusual idea to marry work and the Christmas holiday in one space. Yet many people do work at home today. 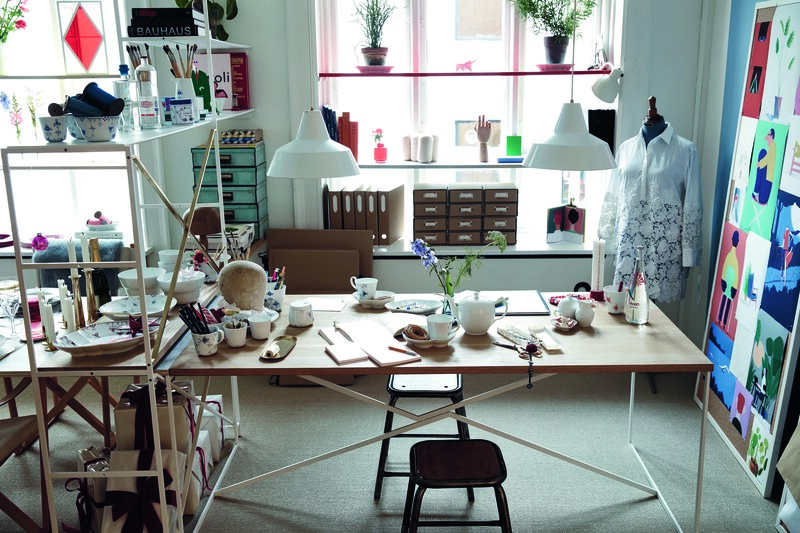 Cecilie Bahnsen’s big table combines both themes using RC’s White Fluted Half lace, and choices from the Elements line for both — with an etagère to divide things up visually. 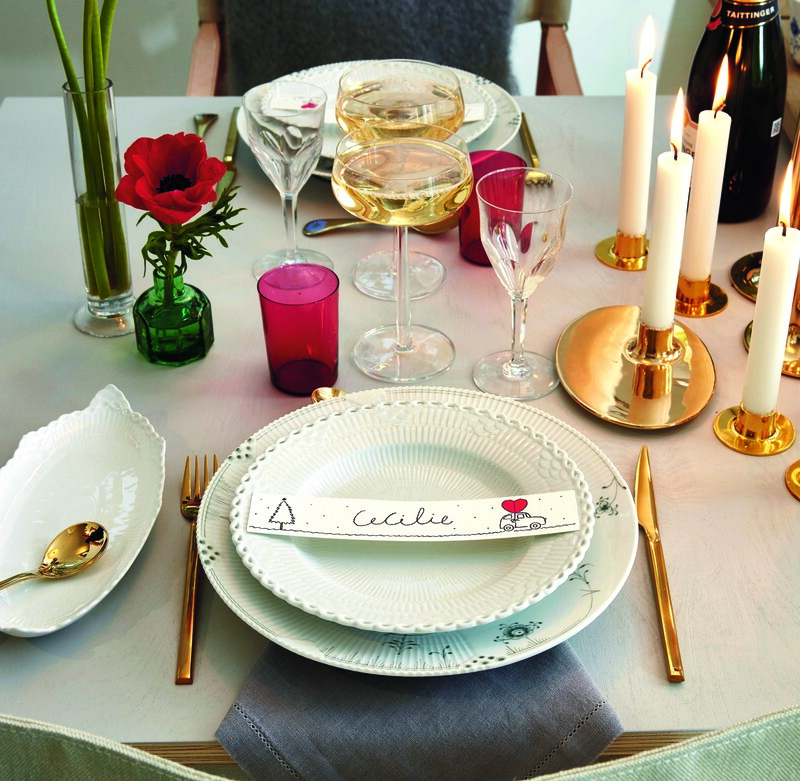 Christmas in the atelier boasts a festive setting for two. 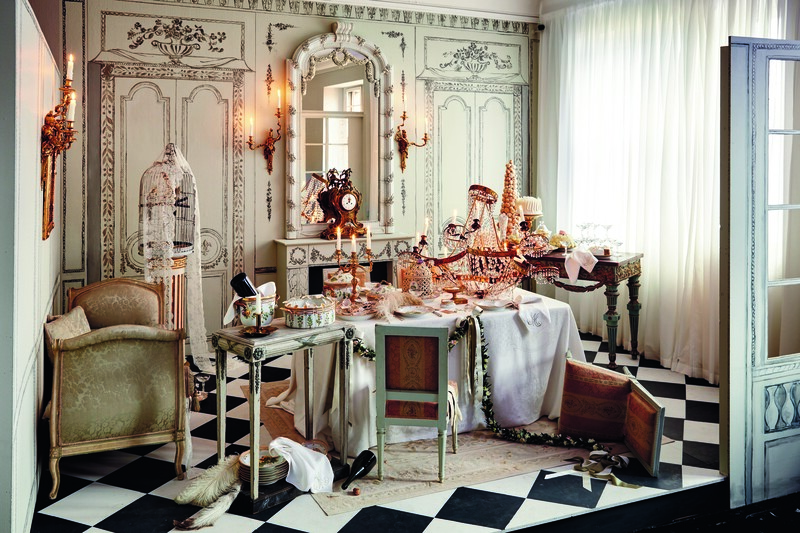 Designers Rikke Baumgarten and Helle Hestehave call this their “deconstructed” Christmas table. To me, it’s a bit like a fractured cobalt blue fairy tale. 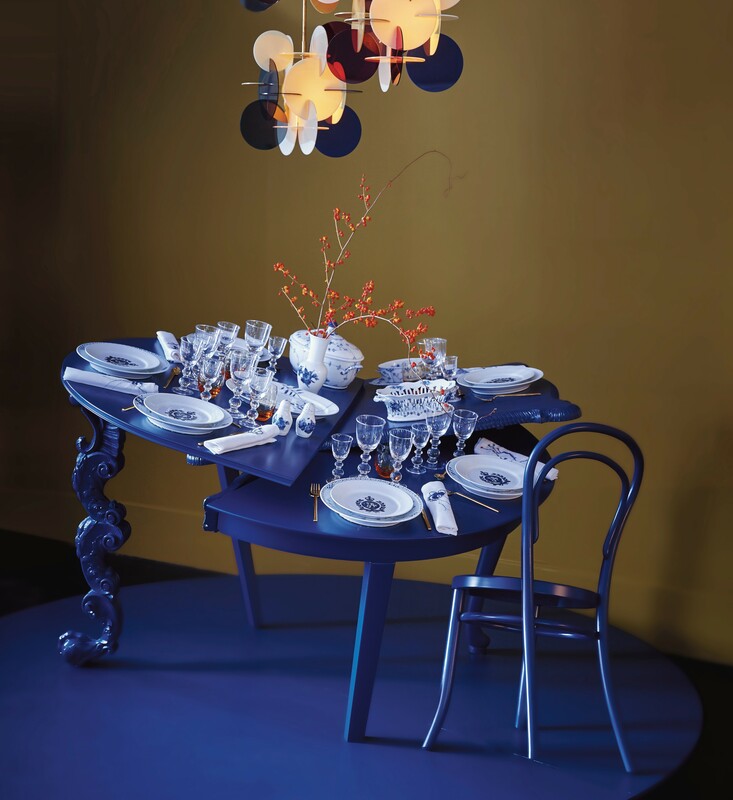 Stepping back, there’s a definite twist here from the gravity defying Blue Fluted Plan and Blue Fluted Half Lace china that stays put on all three levels of the tilted table. Crazy Christmas fun indeed. 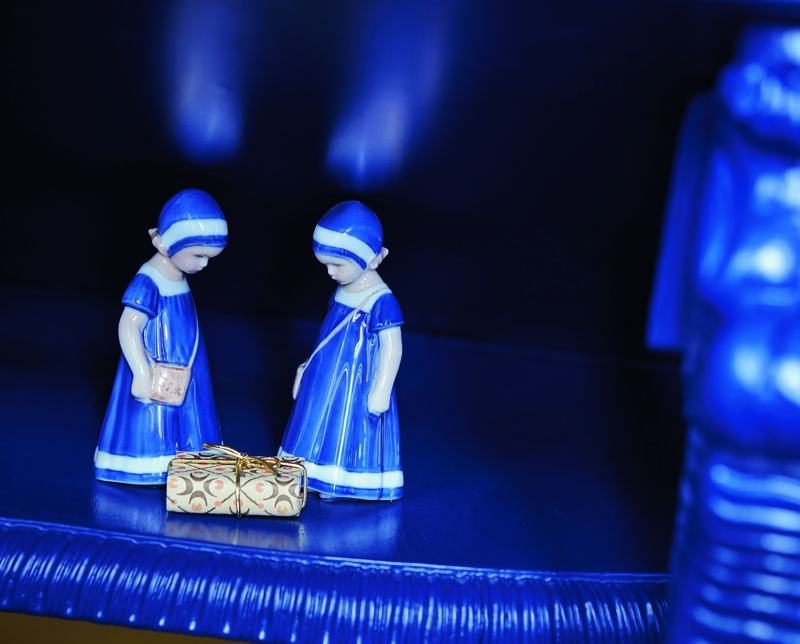 Miniature maidens all decked out in blue and white contemplate a tiny gift. I can never resist a Flora Danica table. As I noted in my post last year, “you may recall that King Frederick V of Denmark commissioned the Flora Danica encyclopedia of botanical illustrations in 1761. By 1790, Flora Danica was the theme for a banquet service — the first production of this historic gilded dish ware.” Gilding and garlands are always so Louis XVI — which designer Ole Yde worked into something of a a Le Petit Trianon bacchanalia fantasy.